Scientists of the Max Planck Institute for Chemical Ecology in Jena have investigated another navigational skill of desert ants. These ants are already well-known for their remarkable visual orientation: they use a sun compass along with a step counter and visible landmarks to locate their nest after foraging for food. After the research team from Jena recently discovered that these ants also use olfactory cues to pinpoint their nests, they conducted new experiments: they revealed that the animals can not only locate an odour source, but also use the distribution of different odours in the vicinity of their nests in a map-like manner. The scientists found that the ants need both their antennae for this odour-guided navigation: they smell the scenery in stereo. The desert ant Cataglyphis fortis is an insect native to the inhospitable salt-pans of Tunisia. To pinpoint the nest – a tiny hole in the desert ground - after foraging for food, Cataglyphis combines several navigation systems: a sun compass, a path integrator (the ant literally counts its steps), and visual recognition of landmarks. Recently, Kathrin Steck, Bill Hansson and Markus Knaden, neuroethologists at the Max Planck Institute for Chemical Ecology in Jena, discovered that local odours also play an important role in the insect's orientation (Frontiers in Zoology, 2009, Vol. 6 No. 5): ants learn to associate a smell with their nest and distinguish this smell from others. But the researchers wanted to know if the insects are also able to recognize odour patterns that emerge, when several odour sources are located at different positions around the nest. And if so, they asked, do ants need both their antennae like stereo receivers just as we employ two eyes and two ears for spatial perception? "We conducted two key experiments," says Kathrin Steck, PhD student at the institute. "First we marked four odour sources surrounding the nest entrance with the substances methyl salicylate, decanal, nonanal, and indole, and got the ants trained on them. If these four odour points were shifted away from the nest in the original arrangement, the ants repeatedly headed for the odours, even though the nest wasn't there anymore. 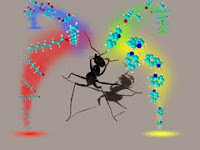 If we rearranged the odour sources relative to each other, the ants were completely confused." Therefore the researchers assumed that ants do not "think" one-dimensionally – i.e. they do not associate the nest with only one smell – but multi-dimensionally, i.e., they relate an odour landscape to their nest. The odour landscape comprising the four substances was monitored with the help of a special measuring technique: the scientists used a specific photoionisation detector to determine the distribution of the odour substances in space and time. Spatial perception can easily be acquired if two separate sensory organs are available, such as two eyes for visual orientation. In the case of the ants, this would be their two antennae. "With this assumption, the second key experiment seemed obvious: We tested ants that only had one antenna," Markus Knaden, the leader of the study, explains. In fact, ants with only one sensory device were unable to make use of the odour landscape for navigation. Stereo smelling in animals is not new – rats and humans are thought to have this ability as well. This new study shows that ants smell in stereo, but not only that: "In our experiments we demonstrated that ants successfully use stereo smelling for navigation in the desert," says Bill Hansson, director at the institute.